Come winter, it can be easy to forget about your lawn. It's not like it needs watering or mowing, so maintenance gets put on the back burner. We hate to burst your bubble, but winter isn't a lawn-free season; there are things you can do, over the winter, to ensure your grass grows back healthy and full come spring. Keep it Short – This step is better done in November, so, next year, plan accordingly. However, if we get some nice sunny days, you may be able to make up this step before the New Year hits. Generally, you want to make sure that your lawn is cut very short before winter. The reason for this is simple: tall grass attracts rodents. Burrowing rodents, like mice, can significantly damage your grass and root system. Short grass is less attractive to rodents than tall grass, so, if your lawn needs a cut, see if you can get the mower out one last time, weather permitting of course. Keep Feet Away – Your grass doesn't die in the winter; it just goes dormant. When dormant, your grass is in a delicate stage and must be given extra care. For this reason, you should try to keep foot traffic to a minimum. If you, your family or your guests tread a path through your grass, all winter long, that section of your lawn may not grow back as nicely in the spring. 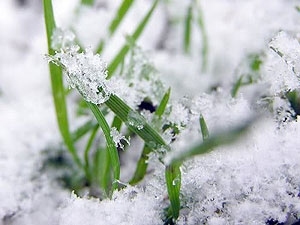 Remove Lawn Objects – If simply walking on dormant winter grass can damage it, imagine what parked cars, old picnic tables, lawn chairs, and sports equipment can do if left out on your lawn over the winter. Over time, pressure from even the smallest of objects can choke out your grass, and the result is not going to be pretty. When spring arrives, areas of your lawn that harbored chairs, cars, camping equipment, etc. can remain brown and lifeless, requiring fertilization and re-seeding. These areas can also be susceptible to crab grass and other weeds as well.